In Brandkit from the beginning whenever you used the search box, every new Tag you added to the search box, refined the search - that is - gave you fewer results. This is known as an AND search. i.e. Find assets that have this Tag AND this Tag. e.g. A search for 'Image', 'University of Waikato' with AND will result in 41 assets found. Now you can switch to OR whenever you're searching for multiple Tags. OR is the opposite of AND and expands your search, giving you more results. i.e. Find assets that have this Tag OR this Tag. e.g. 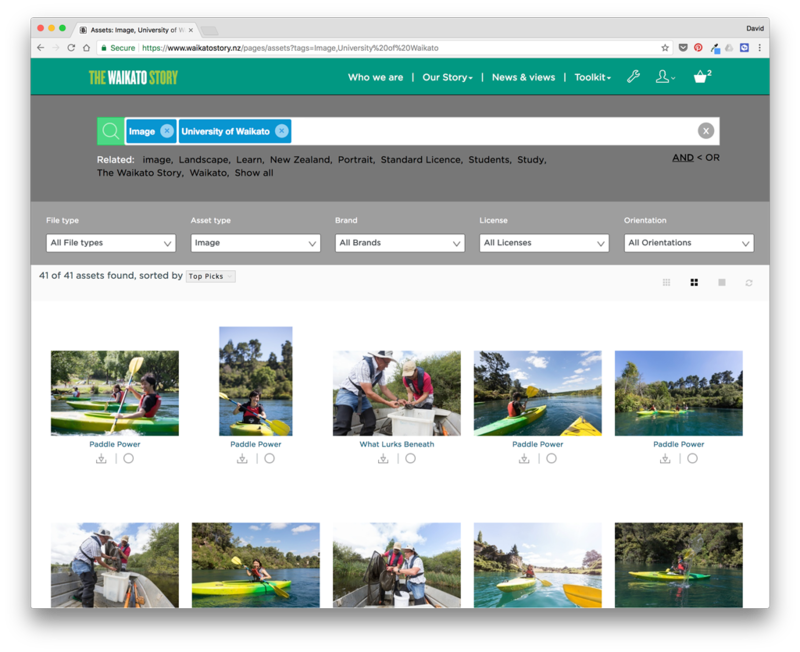 A search for 'Image', 'University of Waikato' with OR will result in 190 assets found. The AND > OR option appears whenever you do a multi Tag search, and appears immediately below the search box on the right hand side. AND is still the default search mode. To switch to OR, click the AND > OR link. The page will reload in OR mode and new search result will load in the Assets Grid. To switch back to AND mode click the link again.